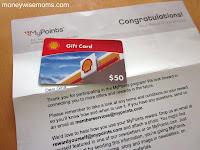 Today’s mail had a FREE $50 Gas Card, courtesy of MyPoints. I’ve mentioned MyPoints before, it’s one of the small ways I earn extra income each year. Typically, I earn $75-100 in gift cards from them per year, just by clicking on the “MyPoints Bonus Mail” they email me. These are offers, similar to what you see on my blog and others–things like signing up for e-newsletters, printing coupons, etc.–but instead of completing each offer, you earn 5 points every time you click through. For just a few seconds of clicking once a week, I earn enough points to redeem for cards like this $50 Shell Gas Card. It’s a tiny amount of time and effort for the payout, and I love to earn FREE gas cards! 1) Login to MyPoints (or make an account if you don’t have one yet). Click on “My Account” in the top right, then “Manage Email Subscriptions”in the bottom right. 2) Subscribe to “BonusMail” only to avoid too many emails and offers. Of course, if you enjoy doing Surveys and other offers, you can earn more points that way. I like to keep things simple. 3) Create a folder in your email program that will filter out your MyPoints Bonus Mails into one spot. I set a filter in GMail so they’re all in one place. 4) Once a week or so, I click through on all the offers, earning 5 points each. Occasionally, I check my account at MyPoints to see what gift cards I’m eligible for. Obviously, $10 and $25 gift cards require less points, but I just let my points accumulate so I can get a $50 gift card, which has a better ratio of points per dollar. 5) Redeem, and enjoy! If you don’t want to earn FREE Gas Cards, there are restaurant and retail cards, or other rewards. **Updated: See my follow-up post on MyPoints. Have you earned any gift cards from MyPoints? Disclosure: This post contains affiliate links. Thanks for supporting MoneywiseMoms at no cost to you–in fact, you’ll earn money on this one! « Meal Plan Monday: Vacation Week! Sometimes I cash in my points for gift cards to use as teacher gifts…..in November, I cashed in points for a Sears gift card b/c my boys needed new winter boots!